Although as early as 1920 the Iron Guard waged anti-Semitic propaganda, which led to street violence against the Jewish population and the passing of anti-Jewish legislation from 1940, once Marshal Antonescu came to power, the Romanian state he headed bore all the responsibility for the Holocaust in Romania. Many documentaries have been made about the Holocaust. Seventy-five years later, the greater part of the Romanian population still believes that we did not kill any Jews, let alone that we were second only to Nazi Germany in the number that were killed. It is to the approximately 380,000 Jews killed in Romania and in the territories it controlled and to the 135,000 killed in northern Transylvania under Hungarian control that I dedicate this documentary. To them and to younger generations of Romanians who only by knowing and respecting the truth will have a genuine future. The first time I met a survivor of the death trains was in Jassy in 2011, when I was working on a project for a French magazine. I still remember that when he began to tell me about the horrors he endured I burst into tears. I was holding my camera in front of my face to hide my tears. It was not at all easy to see Lazar Finkelstein, a mountain of a man, recounting with tears in his eyes how the Jews were rounded up and taken to the police headquarters. The soldiers were lined up on either side of the entrance and mercilessly beat the Jews with clubs as they went into the courtyard. You had to run as fast as you could, hoping not to get hit. The lucky ones received a blow to the back. Others were hit over the head and fell to the ground lifeless. But this “warm welcome” was nothing compared with the rain of bullets that fell on the Jews in the courtyard of the police headquarters and nothing compared with the death trains to Podul Iloaiei and Calarasi. On 29 June, packed into freight cars in conditions worse than for cattle, many of them separated from their families, thousands of Jews lost their lives and were buried in mass graves at Podul Iloaiei and Tîrgu Frumos. The thirty-kilometre journey from Jassy to Podul Iloaiei took more than eight hours. But for the survivors the ordeal was not over. The survivors were forced to bury the dead. Then, they were either deported to Trans-Dniester or to other concentrations camps dotted around the country. Ever since then, I have wanted to tell the story of those people, on the one hand as a testimony to the atrocities that humankind is capable of committing, and on the other hand as a symbol of the heroism and endurance of human beings. Four years later, in 2015, I resumed work on this documentary. After Jassy came Bucharest and then Oradea. The journey on the death train made Miriam see how quickly people can shed their humanity in the face of imminent death. In the crowded freight cars, to sit down could mean death by suffocation. The young girls were forced to go to the toilet in full view of the boys they had grown up with. The old and sick were dying all around them and nobody could do anything. On the journey and then in the ghettos the Jews lost their grandparents before their time. Some of the grandparents gave up the ghost so that they would not be extra mouths to feed, a burden for the rest of the family, which had to survive. The life of an entire generation perished beneath the eyes of the grandchildren. The trauma was to mark all the survivors, perhaps more so even than their own suffering. Remembering how the Romanians treated her on the day of the deportation, Miriam, who is now ninety-two, has never been able to go back to Campulung. She tried once, but was unable to get out of the car. Before she was deported, the young man who was courting Mimi gave her a notebook, which she turned into a diary of her hellish ordeal in Djurin. The young man also survived, but not long after returning to Romania he lost his mind. Not even seventy years after that inhuman experience can the specialist in paediatric oncology sleep without taking sleeping pills or let go of her tears when she remembers her ordeal. But it was in Oradea that I met the most numerous community of survivors. Before the Second World War more than thirty thousand Jews lived in Oradea. Doctors and architects, businessmen and actors, the Jews made a major contribution to the town’s development and prosperity. The Horthy persecution in Hungarian-occupied Transylvania resulted in the death of more than 135,000 Jews. As I have said, the planning and implementation of the Holocaust in northern Transylvania, as well as in Moldavia, Bessarabia, Bukovina, Dorohoi and Trans-Dniester, made Romania second only to Nazi Germany in the number of Jews massacred. Of the around 132,000 Jews deported from Hungarian-occupied northern Transylvania to Auschwitz in the period from May to June 1944, only a handful survived. They include Gabriela Bone, Margit Mezei, Vioara Braun, Clarissa Popescu, Lazar Freund, Ladislau Stauer, Elisabeta Steier, and Olga Gavor. They are among the heroes who survived the Auschwitz and Mauthausen death camps and the ghettos of Trans-Dniester, and I had the honour of meeting them in Oradea. Their harrowing stories, which have lost none of their power to shock even so many decades later, all have a common denominator: the ghetto, the day of deportation, and the train journey to an unknown destination and tragic fate. On the platform at Auschwitz, all the young people bid their grandparents, parents and younger siblings farewell. But only the luckiest of those who got off the train still have a story to tell. “They made selections. Dr Mengele came and made the selections. Dr Mengele came and you had to walk past him in a line, naked, with your arms raised. But you never knew whether it was for work of for the crematorium. And I was a girl of seventeen, although from the start, when our parents were taken to the gas chambers, us they took to the showers and gave us Rif soap, which was made from Jews. After that, of course, we were naked. There were German soldiers who cut our hair, even on our private parts. I will never forget, even if I live to a hundred, the moment when I walked in front of him with my arms raised, completely naked, and he asked me how old I was. I said eighteen, but I wasn’t yet eighteen. I stood there for a few moments. And he stood thinking for a little and then made a gesture with his wrist. That was life for me,”remembers Vioara ‘Ibby’ Braun, a woman of eighty-eight, born in 1926 in the town of Marghita, Bihor county. But the story of Lazar Freund exceeds all imagination. The ninety-four-year-old survivor recounts how with a friend from Oradea he managed to escape from Auschwitz, where the Germans made him work in the mines. Shortly after his escape he fell into the hands of the Russians. Although initially they promised to help him return home, after long and exhausting interrogations the Russians subjected him to forced labour. It was not long before Lazar managed to escape for the second time, this time from the Russians. “Even if everybody else dies, I will survive to tell the tale,” recounts Gabriela Bone (88), born in Targu Mures in 1927. Her family owned a mirror factory in the town. She made her promise to survive aged sixteen in the concentration camp at Auschwitz-Birkenau. As an aside, the Bone family lived on Octavian Goga Street, named after the Romanian poet and politician whom Nazi Germany funded in order to foment anti-Semitism in Romania. “Whatever might be, if you have the will, you will succeed. That is what I have learned from my experience,” Gabriela Bone. Son of Klara Markus (not seen), holding a picture of his mom, as seen in her backyard in Sighet on April 26, 2015. 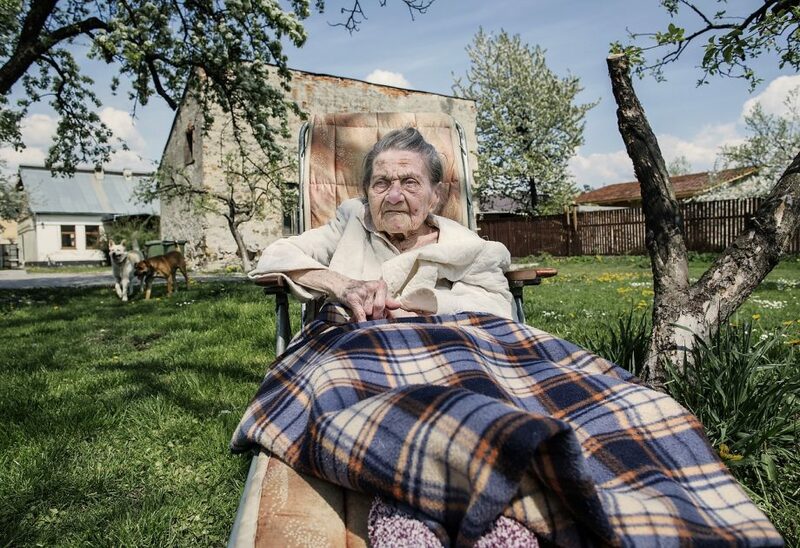 Klara Markus, 101 from Sighetu Marmaţiei, in Maramures in Northern Romania, survivor of three Holocaust concentration camps before the Second World War was over. Mrs Markus, who had been imprisoned in Dachau, Spandau Berlin and Sachsenhausen-Oranienburg, survived the Nazi German camps because the day she was sent to the showers the Nazis ran out of gas. Elisabeta Steuer (L), 91 and her husband Ladislau, 94 (R), at their home in downtown Oradea on March 20, 2015. 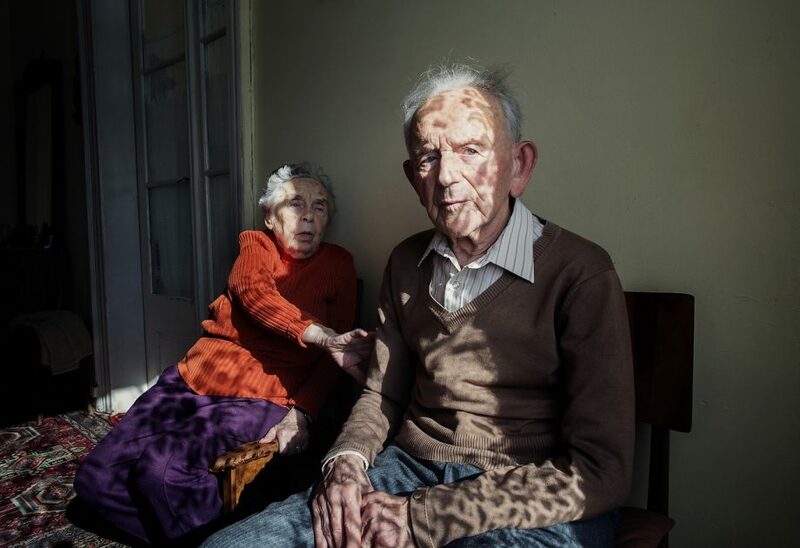 Both survivors of the Holocaust, Ladislau was deported to a Mauthausen labor camp in Hungary while Elisabeta survived in a ghetto in the Romanian village of Ginta. They have been married for 66 years. 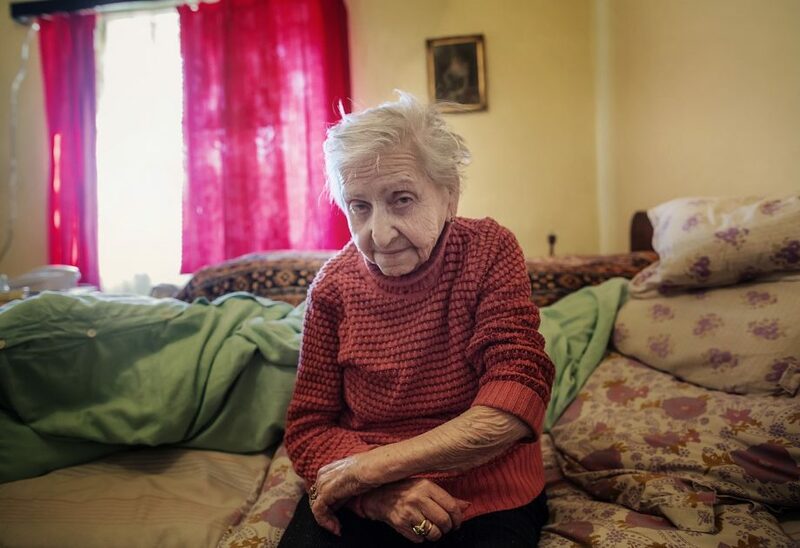 Solomon Golda a Romanian of Jewish origins born in1926 a survivor of the Auschwitz concentration camp, recalling her ordeal, as seen inside her house in Sighetu Marmatiei on April 26, 2015.